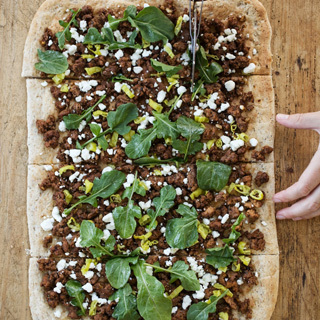 Tangy goat cheese and sweet peppers complement hearty lamb on this tasty pizza. Nutrition Highlights: This pizza features garlic, which provides fiber and disease-fighting nutrients. Brush rimmed baking sheet with 1 teaspoon oil. Using your hands, spread dough over entire length of baking sheet, pushing dough to edge (or roll out on floured surface and transfer to pan). Bake for 5 minutes at 450 degrees. Remove from oven; set aside. In a large nonstick skillet over medium-high heat, heat 1 tablespoon oil. Add lamb, shallot, garlic, tomato paste, oregano and salt and pepper; cook until lamb is completely browned, about 5 minutes. Remove from heat. Brush par-baked crust with 1 teaspoon oil. Evenly distribute cooked lamb and pepperoncini; top with crumbled goat cheese. Bake for about 15 minutes, until cheese looks slightly melted and edges of crust are golden brown. Toss arugula with remaining 1 teaspoon oil; set aside. Remove pizza from oven and top with dressed arugula.